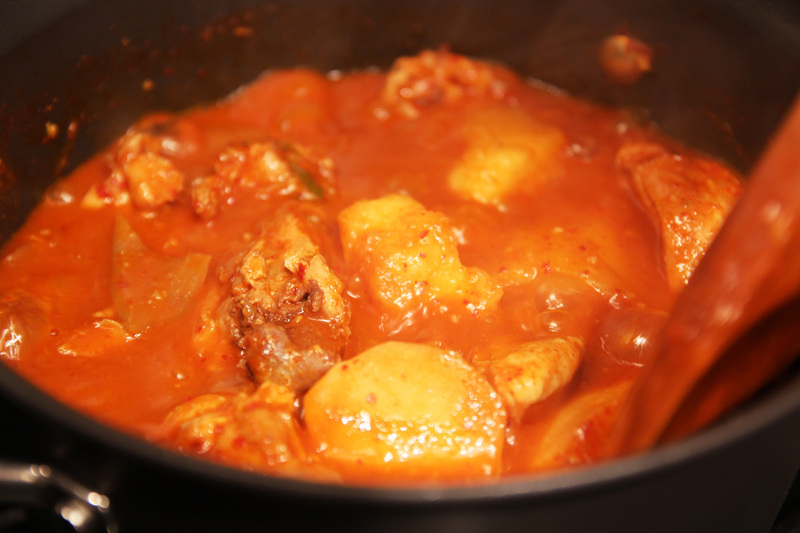 This is my recipe for dak-bokkeumtang, or spicy braised chicken, also called dakdoritang. Many people have requested this dish over the years. This video was filmed in Amsterdam with Sarah Moore as part of my Gapshida project. She emailed me: “I really want to learn dak-doritang, Maangchi. When I lived in Korea when I was young, I always used to eat it at a Korean restaurant. I miss the taste and the smell.” The camera person is Sarah’s friend Rei Nilde, who’s an artist. 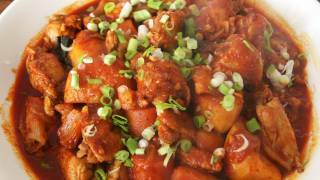 Sarah and I made dak-bokkeumtang for this video and also our potluck party later. The video shows how we served a large group, and everybody enjoyed it with rice, as well as the amazing side dishes that they brought. All of us became good friends even though most of us were meeting for the first time. Chicken wings, soy sauce, garlic, hot pepper flakes, hot pepper paste, sugar, onion, green onions, green chili pepper, and potatoes. Cut 1 kg (about 2 pounds) of chicken wings or chicken thighs into bite sized pieces. Wash and drain. 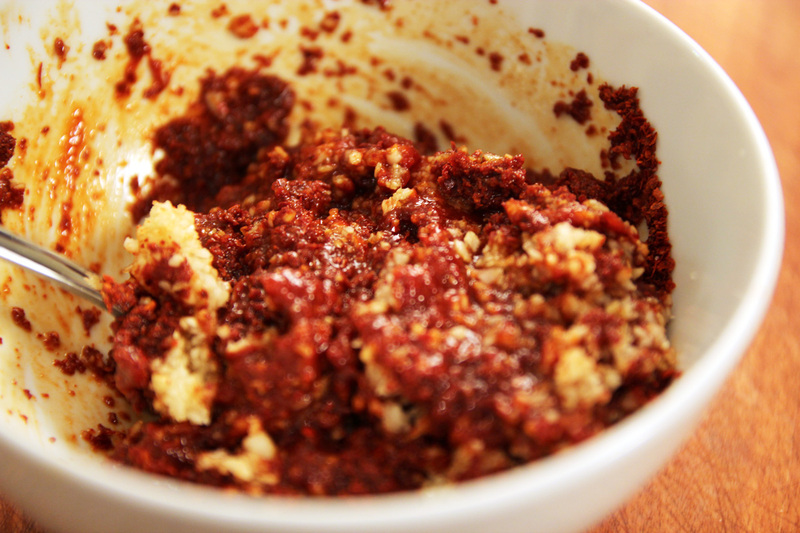 Make seasoning paste by mixing ¼ cup soy sauce, ¼ cup of minced garlic, ¼ cup hot pepper paste, ¼ cup of hot pepper flakes, and 1 tbs of sugar. 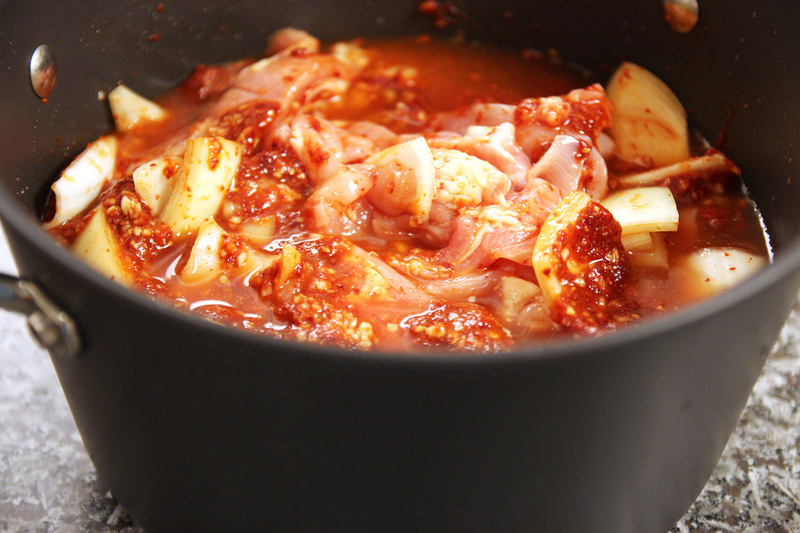 Put the chicken and 2 or 3 medium sized onions (2 cups’ worth) into the seasoning paste. Mix it with a spoon. Add 2 cups of water to the pot and mix it up. Bring to a boil over medium high heat for 20 minutes. Meanwhile, peel 3-4 large potatoes (600 grams: 1.5 pound). Wash and drain them, then cut into large chunks 2 inch across. Set aside. Chop 2 green chili peppers and 2 stalks of green onions into small pieces. Set aside. 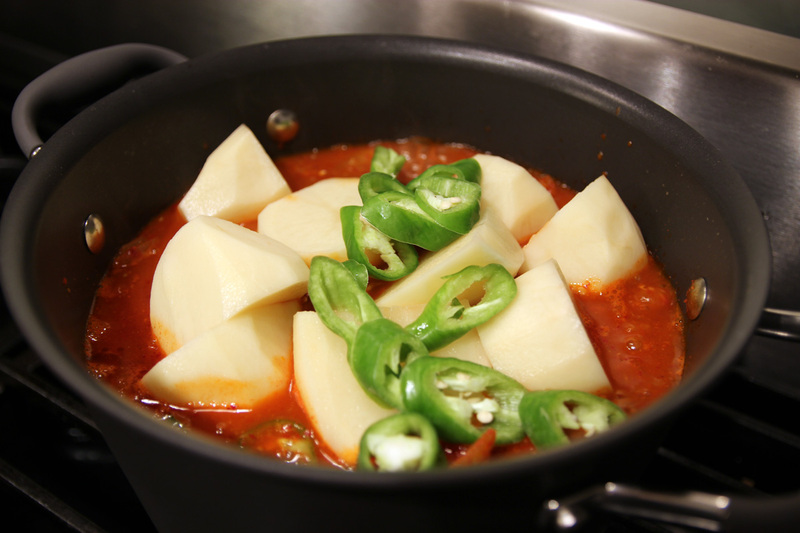 20 minutes later, add the potato chunks and chopped green chili peppers to the pot. Stir with a spoon, then let it cook with the lid closed for another 20 minutes. Open the lid and cook another 3-5 minutes. Keep the lid open to boil away some broth and thicken. Occasionally take some broth from the bottom of the pot and pour it over the top so everything gets some delicious broth. Transfer it to a large serving plate and sprinkle 2 chopped green onions over top. Posted on Wednesday, December 28th, 2011 at 11:43 pm. Last updated on April 26, 2015. Posted March 1st, 2019 at 4:54 pm | Log in to reply. Posted March 7th, 2019 at 9:37 am | Log in to reply. Posted February 27th, 2019 at 11:27 pm | Log in to reply. Posted February 5th, 2019 at 3:23 am | Log in to reply. We absolutely love this recipe. Easy to follow and extremely delicious. Thank you, Maangchi! Posted February 7th, 2019 at 8:18 am | Log in to reply. Posted February 27th, 2019 at 8:30 am | Log in to reply. It looks amazing! I’m sure that it was very tasty! I love your presentation, too! Posted February 1st, 2019 at 3:43 pm | Log in to reply. Maybe my memory is not good, but I swear I remember eating this with carrots in it at different points in time when I lived in Korea. Are there any subtle differences that have to do with the name of the dish??? (I always asked for dakdoritang). Is that unusual? Posted February 27th, 2019 at 8:28 am | Log in to reply. You can add some carrots, too. Posted January 19th, 2019 at 7:52 pm | Log in to reply. Sooo good!!!! Great flavor. 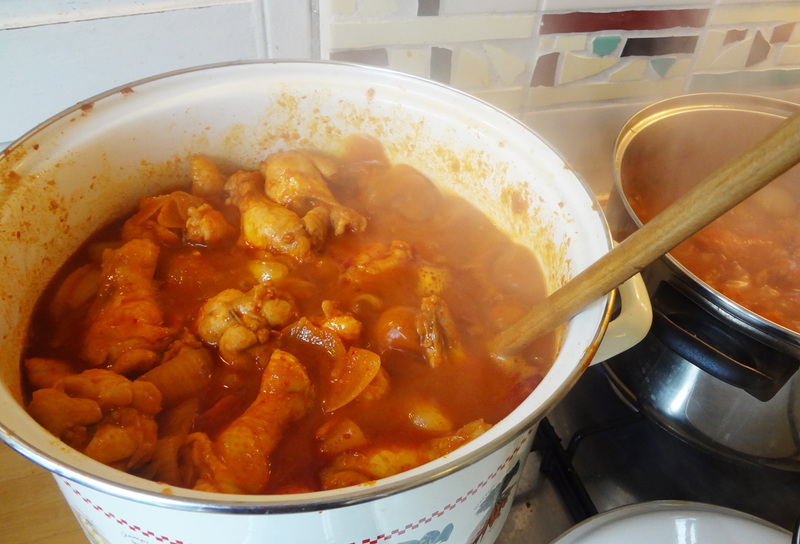 Garlicy, spicy, a hint of sweetness from the soy and sugar and tender chicken and potatoes. Yummmm!! I added eggs because I needed to use them. Didn’t have any green onions but still tasted amazing. Will definitely make again!! Thank you! Posted February 27th, 2019 at 8:27 am | Log in to reply. 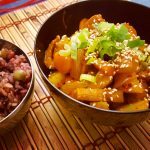 I haven’t made dakbokkeumtang in such a long time, but your photo is motivating me to make it soon! Posted March 5th, 2019 at 5:26 pm | Log in to reply. Posted December 16th, 2018 at 1:14 pm | Log in to reply. Hello Maangchi! 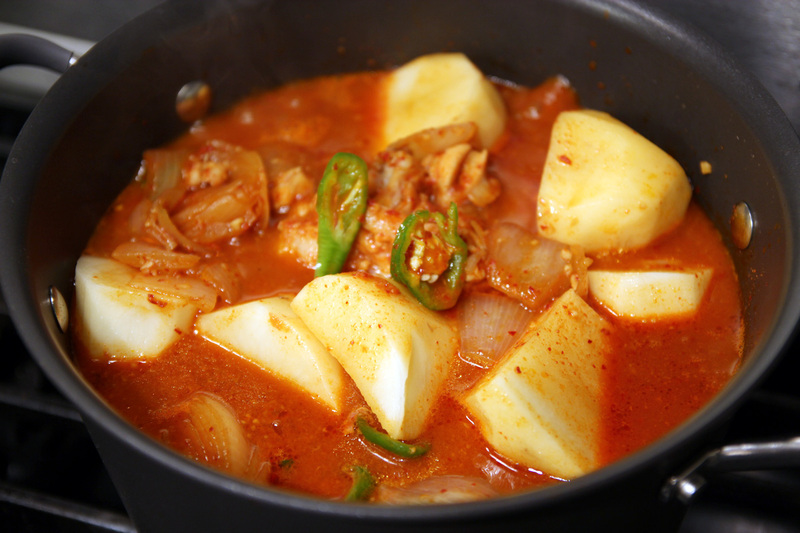 Maybe you are wondering but we cooked Dak-bokkeumtang too :-)! 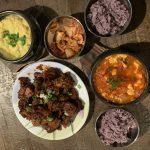 We use seitan instead of poor chicken and we love the recipe! Posted May 10th, 2018 at 2:10 am | Log in to reply. I use your recipe as a guide to season my chicken burger. I season my ground chicken w/ your seasoning sauce recipe, shape & freeze my patties. When i grill one of them to eat with rice “buns” and topped with kimchi instead of lettuce & tomato. It tasted so good that my son asked for second. Posted April 8th, 2018 at 1:03 am | Log in to reply. I used 1 Jalapeno pepper, but it didn’t turn out as spicy as I would’ve liked. I’ll use 2-4 Serrano peppers next time. However, yet another great recipe! Thank you Maangchi. Posted January 20th, 2018 at 1:29 am | Log in to reply. Love your recipe! My son also gave it a try. He said it was a bit spicy. But, he still ate my “stew”. This is the first time I added peppers. There wasn’t the type of peppers you used, so I bought Serrano peppers. I just added 4 small slices, and I could feel that different heat. Wow. Thanks Maangchi! 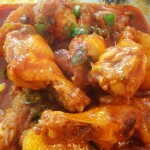 This recipe was originally posted on December 28, 2011 at 11:43 pm by Maangchi. It was last updated on April 26, 2015. The video was watched 934,340 times on YouTube & has 6,680 likes!